The Luminaria House is a magnificent endeavor from designer and importer, Ira Seret, and mosaic artist, Sylvia Seret. This spacious two bedroom home encompasses 2,000 square feet of pure opulence. The house boasts five fireplaces, inside and out, two patios and two decks. Its views include the San Miguel Mission, the Sangre de Cristo Mountains, and our lovely main courtyard. Each master suite is on its own floor and has a plush king sized bed, large closet and wood burning kiva fireplace. The master suites also boast artist Sylvia Seret's grand mosaic tiled bathrooms. The tiles have been collected from around the globe and are from the Seret family collection. Hand carved cabinetry and colorful hand painted tile adorn the designer kitchen and breakfast nook. The pure lapis bathroom sinks are, like many of the ornate features, made and designed by Seret & Sons specifically for the Luminaria House. The living room has cathedral ceilings, a wood burning fireplace and a plush L-shaped couch. Accents of silk embroidery, hand painted Tibetan ceilings, 18th Century carved wood and Gaudi-like mosaics are delightfully displayed throughout the palatial, two-story house. This is a home fit for royalty. 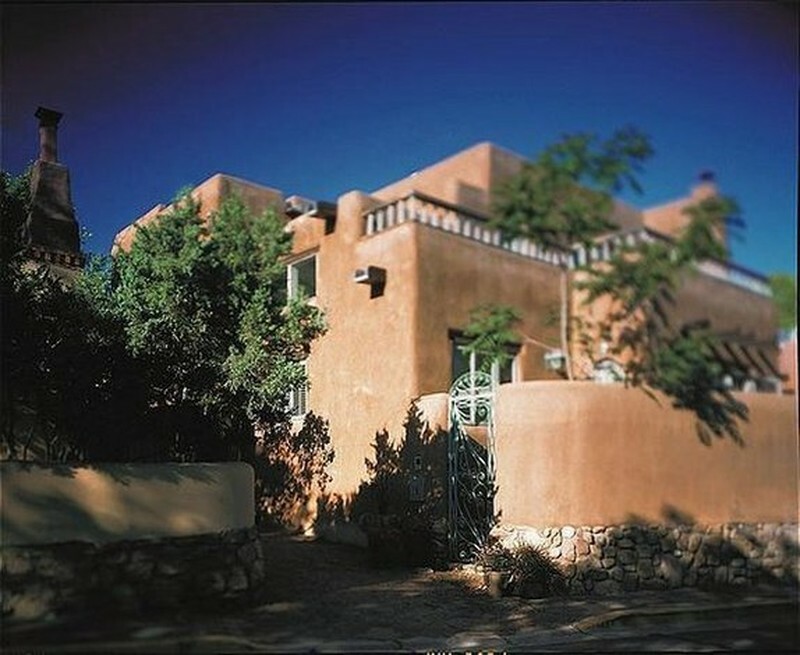 In one of Santa Fe’s most historic neighborhoods, designers Ira and Sylvia Seret, transformed a neglected cluster of traditional adobe buildings into a unique hotel. As internationally-known importers of exotic antiques, rugs, textiles and architectural elements, the Serets conceived the hotel as a showcase for their combined creative talents. From its 1996 opening as “Serets’ 1001 Nights”, the 24-suite hotel has been a magical retreat, brimming with the most exquisite of the Serets’ treasures, collected on travels through Central and South Asia. Sylvia Seret’s glorious, one-of-a-kind tile mosaics adorn the suites’ kitchens and bathrooms, while Ira Seret’s signature design style makes every space an extraordinary living experience. In 2002 the Inn was renamed to honor its sensuous atmosphere along with its many Afghan and Tibetan artifacts. The name, “Five Graces”, refers to an Eastern concept — the five graces of sight, sound, touch, smell, and taste. Each needs to be honored in the full experience of life. Over the years, the Serets’ original vision has been continually developed with meticulous attention to excellent service, cuisine, and comfort as the Inn has grown into newly acquired properties on its historic street. They continually enhance the hotel’s visual experience, updating design elements and collection pieces throughout. In January, 2010 Sharif Seret took on the management of the property, bringing a focused dedication to creating a world class hotel with unparalleled service. The Inn’s mission is to offer guests a uniquely unforgettable experience. Santa Fe is an ancient city by American standards. Five hundred years before the arrival of the Spanish in 1540 there were Pueblo villages here, 7,000 feet above sea level. Tiny houses and large buildings alike were constructed of a durable mixture of mud and straw called adobe. The city – the oldest state capital in the country – was wrought with battles between the Conquistadors and Pueblo Indians for control of the area. Three hundred years later, New Mexico became a United States Territory in 1846, and a state in 1912. Robust trade began by way of the Santa Fe Trail; and the fresh clear air and dry climate brought many people seeking a cure for tuberculosis. The Inn of the Five Graces anchors the historic, 17th century Barrio de Analco, or Quarter “Across the Water” in the language of the Mexican Tlaxcalpa Indians, who came to Santa Fe in 1598 with the Spanish. This is the oldest inhabited block in the United States. Across Old Santa Fe Trail from the hotel is the San Miguel Mission, the oldest church in the United States, and next to it, the oldest house. The extensive, multi-cultural history of Santa Fe, encompassing many religions, languages, and artistic traditions, gives the city a unique fascination today. Walk its winding streets and experience the romance of the past, entwined with the vibrant culture of today.